Miller Centrifugal Casting Company (“MCC”) is a leading producer of high quality, vertically cast, centrifugal castings, serving two markets, each with its ferrous and non-ferrous product lines. MelCap Partners acted as the sell side advisor to MCC. 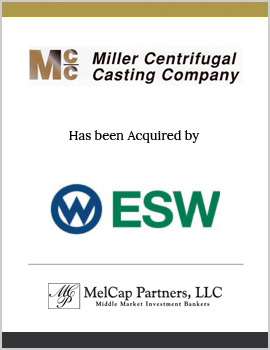 MCC was sold to Eisenwerk Sulzau-Werfen (“ESW”), a European strategic buyer located in Austria.